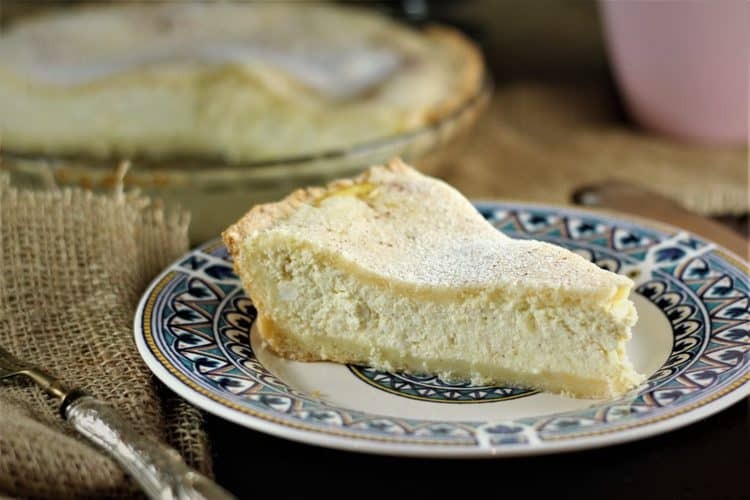 Just in time for Easter, Mom’s Sicilian Ricotta Pie is always a family favorite! 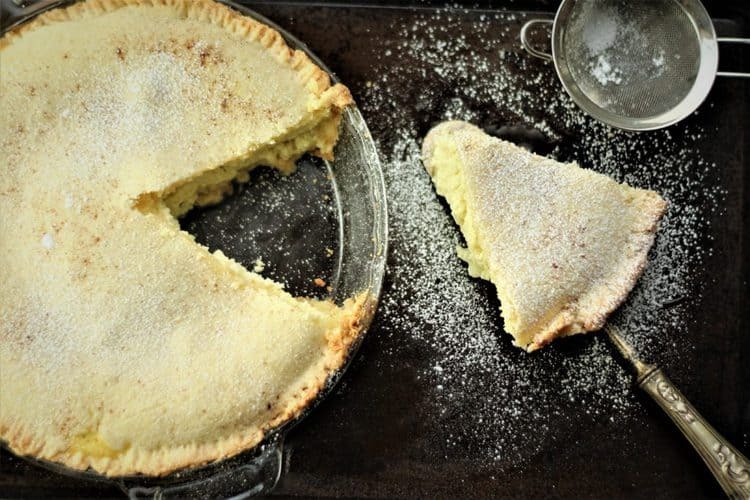 Here’s a recipe I’ve been meaning to get to for a long time, Mom’s Sicilian Ricotta Pie! 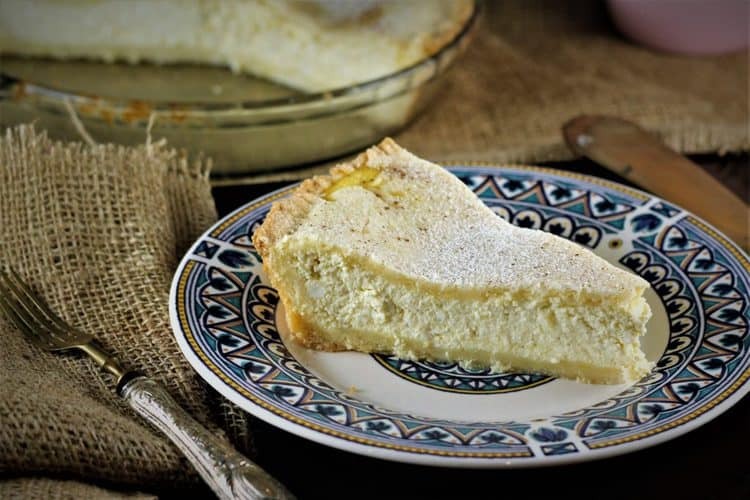 Easter is just around the corner and a good ricotta pie is a must for this holiday. Another of my favorite desserts which also contains ricotta is pastiera. This is a Neapolitan Easter specialty made with ricotta and rice (or traditionally with grano cotto). It is delicious and the simplified version I make has no crust. And, of course, don’t forget about the Sicilian Easter Cudurra cu l’Ova , the traditional Easter bread with eggs which is traditionally given to the children! However, I decided I really should learn my Mom’s Sicilian Ricotta Pie recipe. At the same time, I’ve added yet another ricotta recipe to my ever growing list. You’ll notice that I’ve now added a ricotta category to my recipe index. I suppose it was about time. Watch how easy it is to prepare! Then shape into a disk and place in the refrigerator to rest for a half hour. 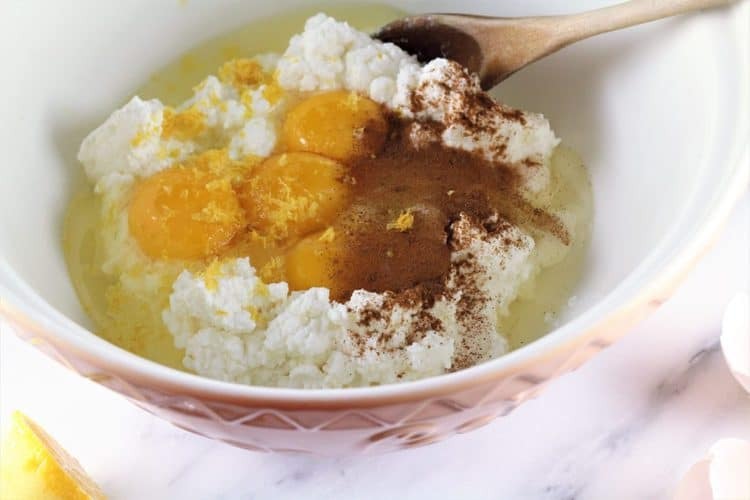 Meanwhile prepare the ricotta filling by simply combining all the filling ingredients in a bowl and mix well. Roll 2/3 of the dough into a bottom crust and transfer to a 9 inch pie plate. Fill with the ricotta mixture. Then roll the remaining dough and cover the filling. Bake at 350F for 55 minutes, until golden. Let cool completely, dust with powdered sugar and serve! 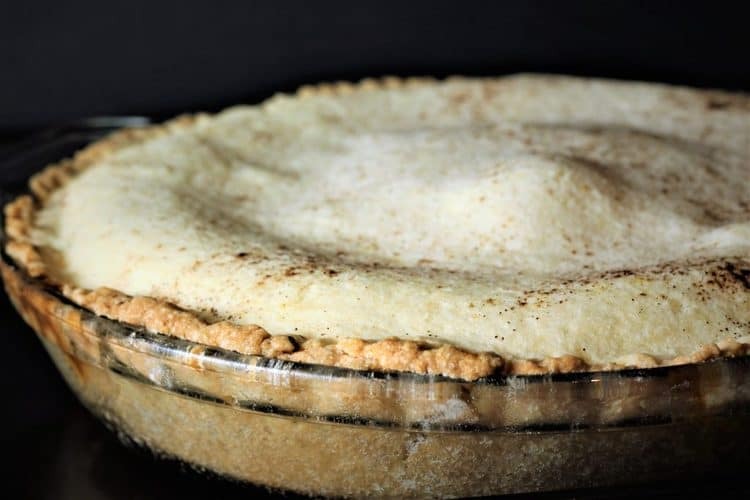 I think I’ve hesitated getting to this recipe because of that ever intimidating pie crust! It’s one of my least favorite things to make because my crust crimping is never beautiful. This time around you’ll notice I didn’t even try to crimp it and resorted to using a fork to simply press the top and bottom dough together. The dough is also quite delicate and it took me a couple of times to roll it out and transfer to my pie dish in 1 piece. Do make sure you chill your dough for at least 30 minutes (or even longer) before rolling. Trust me, it will be much easier. I do recommend that you make it at least a day before serving it. It must be completely cooled before serving and it tastes even better after sitting in the fridge for at least one day. This is the typical ricotta pie that my mother has made since forever! I’m also noticing that it’s becoming much easier for me to document my mother’s recipes. Now, when she says as much flour or sugar that’s needed, I’m actually managing to figure it out on my own. I guess I am becoming an experienced cook after all. I hope you enjoy this pie as much as I do. Please do tag me with your photos with @mangiabedda or #mangiabedda on Facebook or Instagram. And feel free to share with friends! Enjoy and Happy Easter! 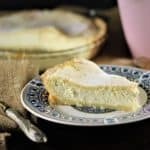 My mother's ricotta pie is one of those nostalgic desserts that brings me back to my childhood. Enjoyed at Easter time or any time of year! If using a food processor: In the bowl of the food processor combine the flour, sugar and baking powder. Add the shortening and pulse until the mixture resembles a course meal. Add the eggs and mix on low speed until the eggs are incorporated. Pour the mixture on a clean, lightly floured surface. Press together until a dough is formed (do not over knead), shape into a disk and wrap in plastic wrap. Place in the refrigerator for at least 30 minutes. Alternately, if making the dough by hand, combine the flour, sugar and baking powder in a large bowl. 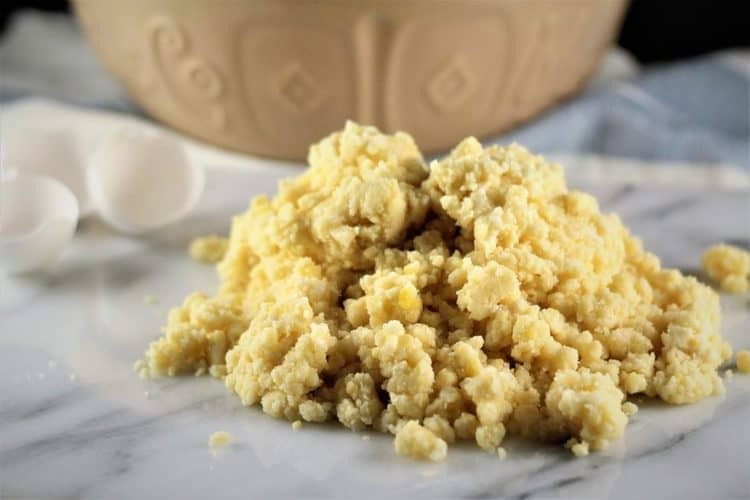 Cut in the shortening with a pastry cutter or use your fingers to mix the butter into the flour mixture until crumbly. Make a well in the centre and add the eggs. Shape into a dough as above. Place all filling in a large bowl and using a wooden spoon stir until well combined. To form the pie: Preheat oven to 350F and prepare a 9-inch pie plate. Cut off 2/3 of the dough and reserve the remaining 1/3 for the top. 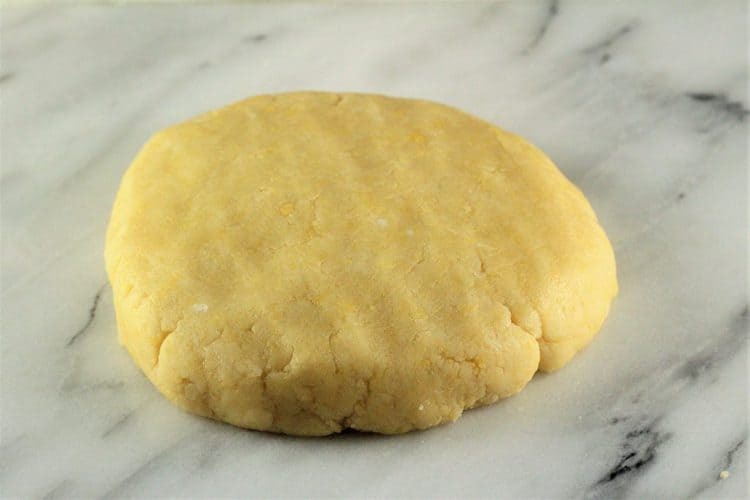 Roll out the dough on a floured surface to a 1/4 inch thickness. 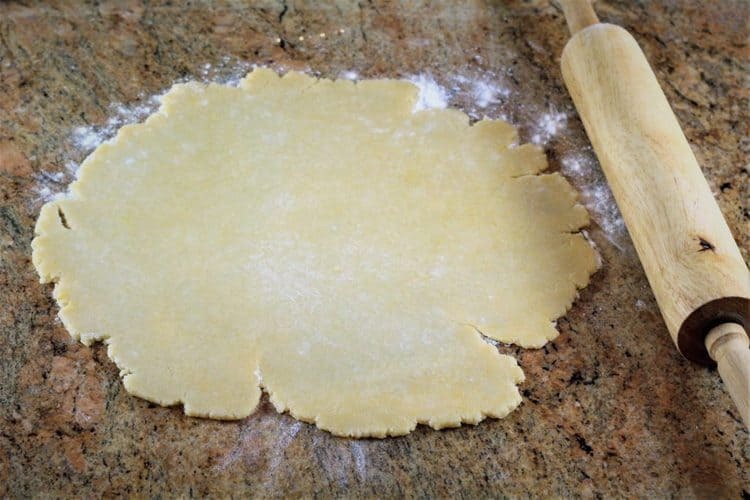 Dust your dough and work surface with more flour if it sticky. Carefully place the dough on the pie plate. Pour in the ricotta mixture, then roll out the remaining piece of dough and place on the filling. Crimp the edges as desired. Dust lightly with cinnamon and bake for 55 minutes until golden. Cool completely and dust with confectioners sugar, if desired, before serving. Do make sure you chill your dough for at least 30 minutes (or even longer) before rolling. Please note that the nutritional information provided is approximate and may vary according to exact portion size. Hi Diane, I'm also totally crazy about ricotta! Yes it is an actual pastry dough as well. I agree, different cultures have similar versions of recipes but may differ in the use of flavorings or spices. It's wonderful to discover new recipes! Thank you Joann, I appreciate the feedback! Thank you Donnamarie, glad you stopped by my blog ! Hello Angel, the no crust version that I refer to in this post is called pastiera and has rice in it as well. You can click on the link for this recipe directly in my blog post where you read about it, or you can write pastiera in the search bar on the right side of my blog. Thanks for your comment! You said you make it without the crust. I have Celiac disease and cannot have gluten. Your crustless piemay work for me. Carman. Hi, the crustless version I refer to in my post is the pastiera which is made with rice. 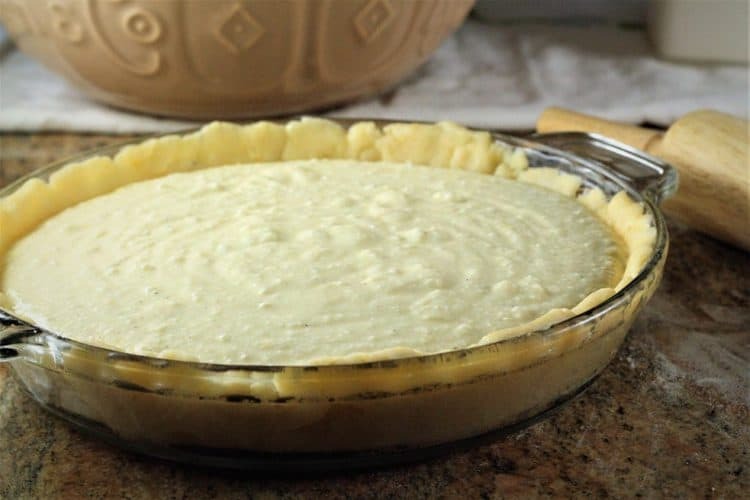 You can click on the link for that recipe directly from the ricotta pie post that you read. Or you can write pastiera in the search bar on the right hand side of my blog. Hope this helps and thanks for stopping by my blog! Hi Joan, I have never frozen it as it usually doesn't last that long at my house! However, my mother has often frozen this pie. Take it out the day before and defrost in your fridge. If the crust is a bit too soft, place it in the oven at 350F for 10-15 minutes so it become more crisp. Then let cool before serving. Hope this helps and thanks for stopping by my blog! It is amazing the different versions of this Italian Cheese Pie. I have not tried this version yet. This looks much different than my mom's. My mom used to put a little orange zest and vanilla in the crust. And she used to put a little lemon zest and lemon juice in the filling - no cinnamon on top. She used to lattice the top. I have a friend that uses rice in her filling, which I do not care for - I think a different part of Italy, but I thought she was Sicilian. Hi Marie, yes there are definitely several versions of ricotta pie and quite honestly I love them all! The version with rice is called Pastiera and is typical of Naples. I have a crustless version of it on my blog which I enjoy cause it’s so easy to make! Thanks for stopping by my blog! Nice and easy, actually typically traditional Ricotta Cheese Cake in most of my Italian cookbooks. I have been making this exact one for years except I use a Zweiback crumb crust and bake it in a spring form pan. You mention 'cudurro' for children ... I don't know what that is. Do you have it in one of your past blogs? I would love to have a look-see. As always, many thanks for sharing wonders from your kitchen! Hi Anna, the cuddura is the Easter bread my mom makes each year. It's a basic bread dough recipe, the dough is braided and eggs are nestled in to bake with it. This is our Easter tradition. It's on the blog, you could search under Sicilian Easter Cuddura. Thanks again! Oh for goodness sake, silly me ... I remember seeing it a while ago and even commented on it. The name is not one familiar to me. I don't ever remember it being named at all. Just "Easter Braid" is what I remember. At any rate, I have your recipe saved safely in my New York Times Recipe Box, to which I can add recipes I want to keep from anywhere on the web. Thanks again. No worries Anna! Some people call it "pupa cu l'ova"but I think that may be a sweet version of it. You're welcome! Our family makes this, but we don’t use lemon zest. It’s my favorite pie. My Grandfather (Nonna) was from a little town near Naples. Hi Connie, it's my favorite pie as well! My family is from Sicily but there are so many variations of this recipe depending on which part of Italy you're from. Thanks for your comment!